WP Engine offers WordPress-only hosting, but it has a lot to offer professionals and novices seeking to create beautiful WordPress experiences with little effort. WP Engine handles all the back-end work, so you don’t have to. Thanks to their outstanding customer support, WP Engine is an award-winning platform that is definitely worth your consideration. At $29/month, you get basic hosting features and have no options of uploading your own website or web app outside of the WordPress CMS. Setting up a WordPress website through WP Engine couldn’t be easier for even the least computer-friendly individuals. WP Engine isn’t your average web host. In fact, it’s a managed hosting environment focused on purely WordPress installations. That said, after signing up for WP Engine, your WordPress website is immediately created for you, no setup necessary. Having your WordPress website preinstalled for you is a nice feeling, as you can jump right into customizing your website. Since WP Engine focuses only on WordPress installations, this means you won’t be able to upload your Linux- or Windows-based website. If you’re looking for a place to do that, you’ll have to look elsewhere, such as at 1&1 or IdeaHost. The other neat thing about WP Engine is that beginners can edit pages on their website through the Staging Area. The Staging Area will take a snapshot of your website so that you can determine how changes will affect your website without those changes actually going live. It goes without saying, WP Engine makes getting your own WordPress website up and running a stress-free process. WP Engine doesn't offer a great return on investment for hobbyists or personal use. In fact, it’s unnecessarily expensive with the most basic Personal package costing a whopping $29 per month. You don’t get anything beyond basic hosting features no matter what package you pick. You’re more likely to get more bang for your buck through 1&1. Businesses that don’t mind a monthly visitor cap are the most likely to get a return on investment, particularly businesses looking to sign up for WP Engine’s Premium or Enterprise plan, which offers plenty of opportunity to produce profits through eCommerce. However, a lack of customization and flexibility on the back-end that you might find in Amazon Web Services or even 1&1 might turn larger businesses away. WP Engine offers excellent and knowledgeable customer support. We tested it multiple times over the phone and email throughout our testing and WP Engine’s representatives have always been able to answer our questions with expert advice. With how friendly and service-focused WP Engine is, it’s no wonder the company won a gold medal in customer service from the Stevie Awards. The downside to WP Engine’s customer service is availability. Toll-free telephone support is only available during the working week, Monday through Friday from 7 a.m. to 7 p.m. CST. WP Engine does offer 24/7 email and ticketing support, although it took almost six hours for someone to get back to us through email. If you have an immediate need, they do offer excellent 24/7 Live Chat support to its customers through the User Portal. In fact, they were willing to walk us through the entire setup process, from getting a satisfiable theme loaded on our WordPress website to even directing us to creating our first post. WP Engine comes with a few useful features. You’ve got daily website backups and WP Engine updates your plugins automatically. There’s also the aforementioned Staging Area as well as WP Engine’s own Evercache technology. This makes pages load a whole lot faster through the combination of caching and proxy servers. You also have the option of adding on a Content Delivery Network to your website package to make pages load even faster. It’s already included in Professional, Business, and Enterprise plans, but not the basic Personal plan. It’ll cost an additional $20 per month, but is worth it for the added speed. Beyond that, WP Engine’s variety of available features are extremely disappointing. You don’t get free email included in most web hosting packages out there. In fact, email isn’t available at all. Not only that, but WP Engine doesn't even sell domain names, requiring you to go through a third-party like Google Domains or GoDaddy. When you sign-up for WP Engine, your domain will actually look something like placeholder.wpengine.com. It almost makes other web hosts look more attractive since most offer cheaper hosting packages and convenience by offering a sometimes free domain name as well as email. WP Engine offers a variety of WordPress hosting packages. There’s the Personal plan ($29 per month), which gives you one WordPress installation, 25,000 monthly visitors and just 10GB of storage. 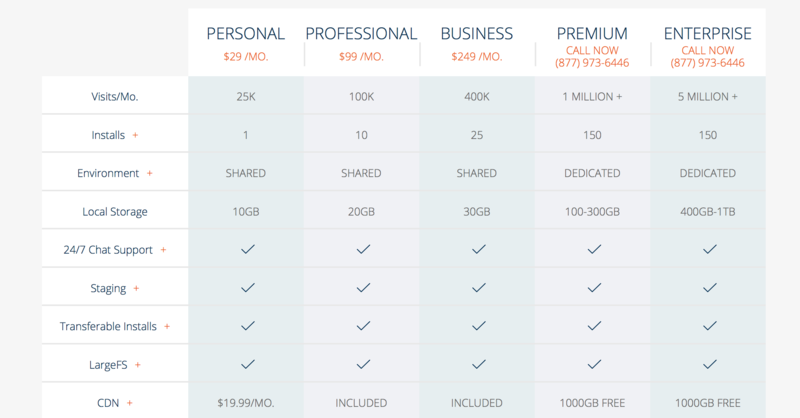 The Professional plan ($99 per month) bumps you up to 10 WordPress installations, 100,000 monthly visitors and 20GB of storage. Then there’s the much pricier Business plan ($249 per month), offering 25 WordPress installations, 400,000 monthly visitors and 40GB of storage. The Premium plan will give you up to 150 WordPress installations, 1 million visitors and options between 150GB and 300GB of storage. For the Premium and an Enterprise plan, you have to call their sales line for pricing and customization. Putting a cap on monthly visitors is an interesting business model, as even 1&1, a cheaper web host that offers great WordPress web packages, imposes no such limits. If you are to go over your monthly visitor cap, WP Engine will charge you $1 per 1,000 visitors. That said, while WP Engine won’t stop visitors from hitting your website, you will end up with a monthly bill for any overages. All in all, WP Engine is a decent host for those looking to start a WordPress website. It’s way too pricey for hobbyists and personal use, but could be an ideal solution for businesses. On the other hand, WP Engine focuses solely on WordPress, so if you want to launch a web app or upload a standard website, WP Engine can’t help you out. This makes the service extremely limiting with a lack of versatility.